There may be times when you need to send login details to people for them to access Tithe.ly ChMS. Using any of the following methods, this will allow the user to set their password, and if not set already they can also set their username. If their username is already set, it will display their username for them. The link will remain valid for two weeks, or until the user has successfully changed their password, or has successfully logged in. Bring up the person’s profile by searching, or by going to People from the main menu. Click on the person and go to the ‘Volunteering & Account’ tab. 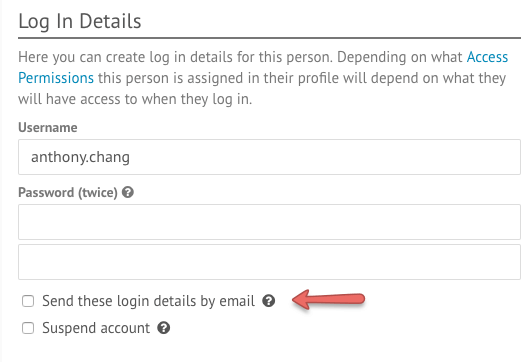 Select the box under the password fields that says ’Send these log in details by email’. Click ‘Save’ to send login details. Go to People > Volunteers. You can use the Filter on the right sidebar to get a list of filtered people matching their particular People Status, Access Permissions, Departments, Demographics and Location. 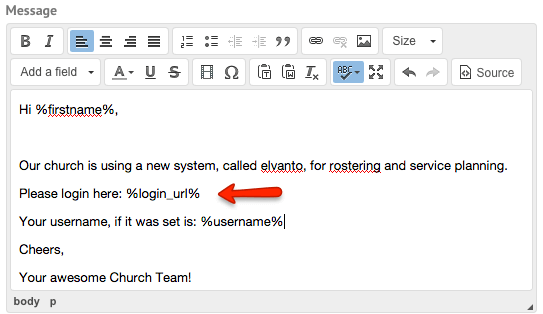 Once you have the list of people, click the ‘Send Log In Details’ button on the top right. In this Contact Volunteers window, choose which volunteers you wish to contact. Finally, choose whether to send an email or SMS. When finished, click the ‘Contact Volunteers’ option and their account details will be sent to the volunteers you selected. You can also send login details to a group of people by creating a People View or performing an Advanced Search. Once the list of people is displayed, go the top right hand side of the page click on Contact People. Add in any text to the email, and simply include the %login_url% placeholder in the email text and click ‘Contact People’. This link will determine if the user has logged in before and if not, send them to a page to set up a username and password. Alternative, you can use the %password_url% placeholder as well, which will always allow the user to reset their username/password, in the same way as the built-in templates do. In all methods described above, it will send people a link where they can set their placeholders. These links expire in one of three scenarios, whichever happens first. We often find people who complain about the link not working, fall into category 3 where they’ve used the link and then forgotten the password and are trying to use it again. In these scenarios we simply recommend resending them their login details so they can reset it and hopefully not forget their newly set password.